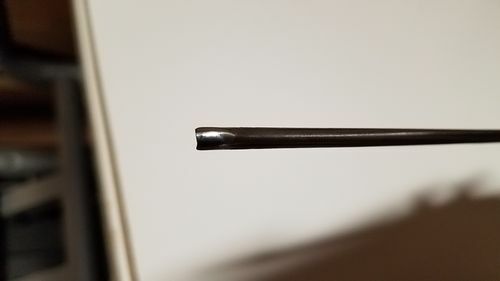 I recently purchased a V gouge and a small #5 gouge from an Ashley Iles seller. These are the first carving tools I’ve ever purchased, so I’m not quite sure what’s normal, but a couple things seemed odd to me. 1. The two tools arrived with the ends dipped in thick wax. It looked like the same wax used to seal green wood. Maybe it’s normal, but it seemed odd to me. 2. The V has a highpoint at the very bottom of the V, and had dust/shavings on it like it had been used previously. 3. The #5 has what appears to be a damaged/worn cutting edge. I don’t remember what the site I ordered from specified, but with a top quality tool brand like Ashley Iles, I expected them to arrive in nearly ready to use condition. I have some Pfeil tools coming that specifically noted they come sharpened and ready for use (what I would expect from a top quality tool brand). Are the items above of no concern, or did I get the short end of the stick a bit? Ashley Iles chisels come in wax. Iles chisels do not come Honed. Pfiel comes ground and honed, ready for use. Most everyone else expects you to hone them yourself, to your sharpening standards. Your chisels are perfectly fine. Oh ok, thanks! I expected to sharpen the edges a bit, but I was surprised that I’ll likely need to grind/shape the edge. Any recommended tutorials or videos on how to properly form an edge? 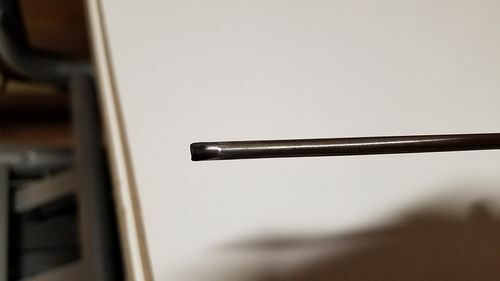 I’ve investigated sharpening to make sure I have a handle on that, but haven’t looked at the earlier forming processes yet. 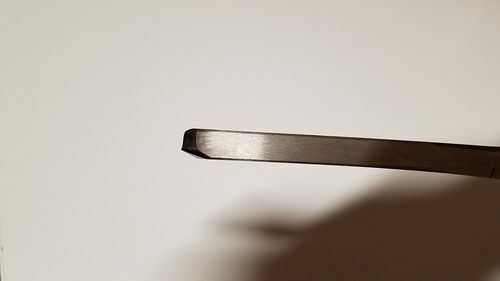 85go I use Ashley lles carving chisels and yours do look a bit rough to me.But if they cut then I would use them as they are.Try to keep them cutting as long as possible by honing with strop a some type of compound.I use jewelers ruge but have several other too. When I do need to reshape I use a Tormek and carefully do the work under good strong light with a magnifier. Is this true? I was watching Mary May sharpen a V tool and she specifically warned against forming a horn. 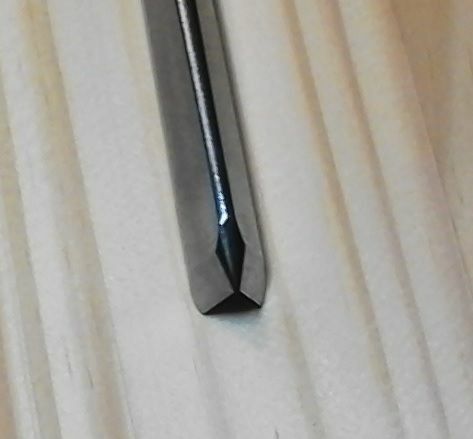 A V-parting tool has three facets on the outside: a flat bevel on the left, a flat bevel on the right, and a flat on the bottom. When sharpening, sharpen each facet more or less evenly so that there is a nice even V edge on the inside. If you don’t work the flat on the bottom enough, it will stick out farther than the sides of the V (I think this is what is maybe what Mary May would call a horn?). If you work the flat on the bottom too much, the bottom of the V will recede and not meet the sides of the V. When dealing with the inside edge of the V (or any gouge), there are two ways. Some people like a small bevel on the inside. 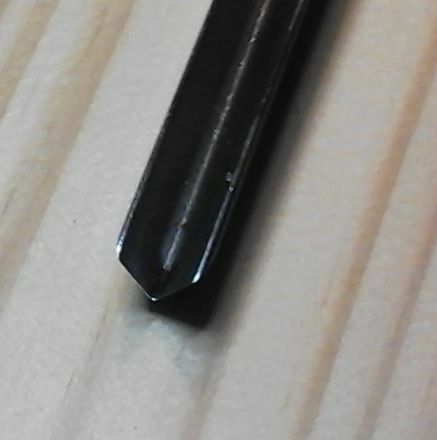 Others like me don’t and only work the inside edge enough to remove any burr from sharpening the outside bevel(s). 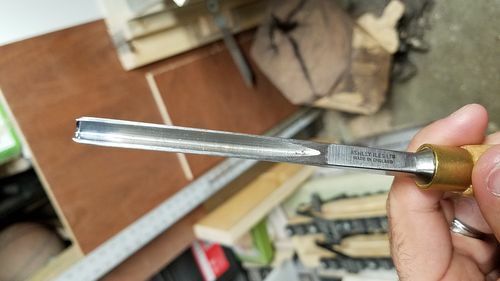 Pictures of my largest V-parting tool, showing the three outside facets, and no bevel on the inside of the V.
Now that’s a nicely shaped v gouge much bette than mine I think. Thanks, that’s what I was envisioning. Mine has a good 1/32” or maybe even 1/16”, horn sticking out from the bottom. The customer service response was that a properly sharpened V should have a horn. Thanks, that s what I was envisioning. Mine has a good 1/32” or maybe even 1/16”, horn sticking out from the bottom. The customer service response was that a properly sharpened V should have a horn. Uh, customer service is wrong! Still good tools, but sharpen it yourself or send it off for sharpening. It won’t have a horn on it when it returns!